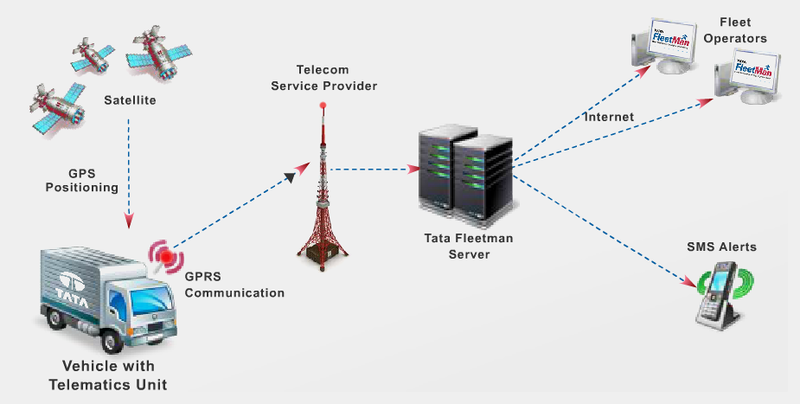 Telematics combines the use of telecommunications and informatics to provide vehicle monitoring and tracking for fleet managers. It works on GPS technology for location information and GSM telecommunication technology for transmitting the data to an online server. The GPS receiver of The Telematics device fitted inside the vehicle takes information from GPS satellites and pinpoints the exact location of the vehicle location through its spatial co-ordinates. The device transmits this data continuously through a GSM module which acts as an internet or phone connection for the vehicle to an online server via GPRS or SMS. Besides capturing location data, Telematics unit can also capture and send additional information of events related to vehicles like speed, stoppage, theft, temperature etc. The online server receives this data, processes it into a user friendly format and stores it into the database. Fleet owners can access this information about their vehicles by logging on to a specially created website. They can track all the vehicles in their fleet on a map on real time basis in addition to getting all kinds of reports. The system can also send Alerts for certain events or emergencies through SMS or email to the fleet owners so that quick action can be taken. With the help of Telematics, fleet owners can effectively monitor all the vehicles in their fleet individually and collectively on real time basis. No longer do they need to get anxious about the state of the vehicle. Whether it has deviated from the route or whether it is over speeding. It not only helps them to track vehicles but also provides the information and scientific tools for better management of their fleet, thereby increasing its efficiency, productivity and hence profitability.